PE html PUBLIC "-//W3C//DTD XHTML 1.0 Transitional//EN" "http://www.w3.org/TR/xhtml1/DTD/xhtml1-transitional.dtd"> Given the option which would you choose. Given the option which would you choose. IF it was possible to live 'free as a bird', would you choose to do so? IF you could get all the sustenance from the environment that you need to survive solely utilizing your own resources similar to a bird, instead of depending on technology like our society does, would you choose such a way of living? My unqualified answer is Yes. Birds have been around a lot longer than humans have. Is it possible they are more evolved than we are? Re: Given the option which would you choose. Same answer here Peter. This gent certainly looks as if he knows something we don't. One of the key differences between the bird approach and the human approach is that birds mostly adapt their body to their environment while humans mostly adapt their environment to their body. Just the Flying part alone would make reincarnation as a Bird an upward trade from Homo Sapiens. There is a poll at the top of this thread where you can vote to reflect your opinion. Please do so as I am interested in seeing the statistical result regarding this question. I have an affinity with Ravens or they with me. I have had a number of ethereal experiences involving ravens. This story took place practically next door to where I currently live. Haida Gwaii was named the Queen Charlotte Islands by the Europeans for a period but are now renamed to the original native name and are about 150 miles away from where I live by water. One of the lookouts I spent several years on was right on the edge of a cliff on the top of a mountain. The cliff was near vertical for several thousand feet and caught a lot of wind causing strong updrafts right in front of my lookout which the local ravens loved to play in. Most days there were several dozen of them there and they were my only companions. To entertain them and myself I would let out long streamers of toilet paper which would soar in the updraft. The ravens would have a great time shredding them into smaller pieces. Stray eagles were not welcome by the ravens who although smaller in stature could fly rings around the eagles and harassed them until they had all they could take and left. Below is a post of mine from around 2000 on the WRH forum. It is about an experience initiated by some ravens. I agree spiritualism is mostly internal but it also exists around us. We just need to be still enough and away from the clanging and banging of civilization to become aware of it. To me a mystical experience means one where everyday reality comes into physical contact with the spiritual realm. If used wisely drugs can take you to or through this boundary but what about in straight reality? I have had about six of these experiences and they have all affected me profoundly. The experience that impacted me the most took place in the early 70's when I was in my 20's. I was not ready to deal with the experience and consequently didn't participate fully. No regrets, everything happens in its own time. If this experience happened to me today I wouldn't hesitate for a second. Who knows I might get another chance. At the time I was living and working with a family built around a band called "The Flying Hearts" and also fondly called "Brain Damage". We lived mostly like Celephais' family in the city but also had alternate / pioneer lifestyle homes in the country. We toured a lot. We decided we needed a break where only the band members would spend a month or two somewhere to work up new material for the band. We found a house in a mostly abandoned mining town called Riondel. It is situated at the end of the road on the east shore of Kootenay Lake in BC. By nature I am a solitary individual and can only live in close quarters with others for short periods. We worked hard for about a month and started to burn out and decided to take a break. I decided I would spend my break on a solitary wilderness hike for a week or so. As I mentioned Riondel was the end of the road (from the south) on the east shore of the lake. The lake continues further north about 70 miles through rugged mountainous terrain. There is a very interesting community at the north end of the lake called Argenta. It is a small Quaker settlement of about 50 people that has minimal road access from the north. Many of the greatest thinkers in the world have visited there. My hike would take me about 70 miles from Riondel to Argenta through the wilderness. It was late winter and there was still much snow on the ground. The weather was socked in low clouds with blowing snow and rain. It was dark dreary and wet. The lake-shore was mostly rocky and hard hiking so I traveled mostly a 100 yards or so inland in the forest where some soil had built up. There were many game trails and I just meandered along following them. On the second day in the afternoon a group of Ravens discovered me and were very curious. They tagged along with me for several hours and were very vocal. They would fly from tree to tree and squawk at me and the other Ravens. I got the sense they were joking with each other about this strange being in their midst. I felt this was being done in good spirit and teased them back. In the late afternoon I got the sense they were trying to tell me to stop. I would normally have continued on for another hour or so but decided to trust my instinct and stop. I liked watching the lake so to camp I would go down to the shoreline out of the trees. I proceeded to do so when the birds convinced me to stop. I stepped out of the trees onto a rocky point of land. Directly in front of me was a large boulder with a Bald Eagle sitting on it. It looked around at me and then took to wing. It flew a couple of circles around the boulder to gain height and was gone. This was kind of exciting, the eagle had been less than 10 feet from me. The point was too rocky for camping so I looked down the shoreline for a more comfortable spot. I saw a likely looking spot about a hundred yards away. I wandered there and started to clear a spot of rocks to spend the night. The whole trip so far had been totally socked in and windy. The clouds were about a thousand feet above the lake and the rain and snow were blowing sideways. As I was bent over picking rocks I felt my back get warm at the same time as it got brighter. I stood up and looked across the lake and the sun was peeking through a small hole in the clouds low in a notch in the mountain's skyline. The sun was about 3/4 set. Just above it a rainbow started, I followed the ark with my eye and it ended about a 100 yards from me right at the rock where the Eagle had been sitting. I kind of freaked a little as rainbows are things you see in the distance and move if you try to approach them. This one just sat there almost as solid as the rock. To my mind this was a supernatural occurrence and I was nervous about being there. After a moment I did get up the nerve to approach the rainbow. I got within 2 feet of it and stood there looking at it. It was about 15 feet across and almost opaque. I stood there for about 3 minutes trying to get up the nerve to step into the rainbow. I didn't do it. The light grew dimmer as the sun set and the rainbow slowly dissipated before my eyes. I decided to stay there rather than go on with my hike and spent many thoughtful hours over the next few days sitting on the rock where the eagle and rainbow had been. I still get much peace from reliving this experience. What would you have done? What do you think would have happened if I had stepped into the rainbow? I think the clutter and noise of modern civilization stops many from experiencing these type of situations. The hints to their existence are very subtle and easily get lost in the hubbub. Thanks for sharing this great story with us. In my opinion, events such as these that involve the natural world are more significant than anything else one can experience. Perhaps the story has more meaning to you given you didn't step into the rainbow? If you had done so, and nothing happened, it might not hold the same significance as it does. Along similar lines, I find synchronicity fascinating. I've had a number of really good ones in my life so far. Interestingly, you posted this today and just yesterday I saw a double rainbow in which some type of swallow birds were playfully flying around in, which I paused and reflected on at the time. Much like in your story, the rainbows came as quickly as they went. It's little moments like these that seem to make it all worthwhile. I have to mention another incredible synchronicity I experienced while my wife and I were away last week at our cottage retreat. In the morning she told me about a strange dream she had, in which a hybrid turtle/crab creature was preventing her from entering a public bathroom she was trying to use. She rarely remembers her dreams and had to mention it to me because it seemed so odd to her. Later in the evening I met up with a friend. Unexpectedly a couple of his friends also dropped by. We were sitting around just having a chat when one of the friends mentioned he had been fishing that day and caught a large endangered black cod. Now on the topic of endangered sea creatures, the other friend started up with a story about eating a coconut crab while in Vietnam. My ears perked up at mention of the crab as I thought back to my wife's story. What happened next really blew my mind because he started talking about turtles! Now I've had some cool synchronistic events before, but this one by far was the most profound. My wife wasn't there but when were having dinner that night I told her about the crab/turtle discussion and she was equally impressed. It was then she confessed she almost didn't mention the dream, because it was so strange. So what is the significance of these events? IMHO they point to the fact that reality is much more than our reductionist cartesian worldview suggests. Jung held a similar belief. Says it all. 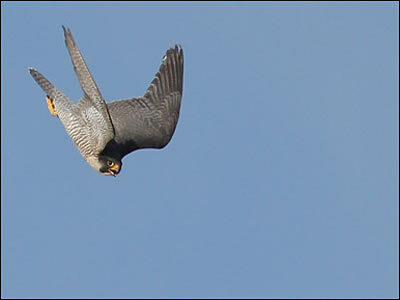 Next go round here, I'm coming BACK as a Peregrine! From what I remember from optics classes in some physics course, I don't think an ordinary rainbow can appear solid like this at such a close distance. It would be transparant and move about and shimmer as the diffraction of the water droplets moved and evaporated. I would have been interesting if you had approached it a lot closer. If it had maintained this solidity at ten or twenty feet, it certainly would not have been one of your off the assembly line rainbows :-) One possibility that occurs to me is if you had stepped into the "rainbow," your spirit would have temporarily left your body and been transported for a visit with some very interesting and benevolent beings. In short, my guess is that it may have been a dimensional portal. I also think that this is your gut feeling as well. I was one of the two no votes so far in the poll. Out ancestors have been tool makers since Homo habilis 2.5 million years ago. I think it is our destiny to be involved with technology until we graduate from the human line and leave the third dimension once and for all. We have just been soured by the incredible weaponization of the technology by eons of assholes. Not that a couple of incarnations technology free wouldn't be a welcome break, but they would be outliers and not our destiny. I also love Ravens and had a friend in Yellowstone who would sit on my rear view mirror less than two feet away and talk to me. Have some great photos of him a few thousand miles away in my storage area. I didn't write clearly enough, I actually approached to within 2 feet of the rainbow. I could have extended my arm and had it buried halfway up to the elbow. The rainbow did not move or become less opaque. I got a strong sense it was sentient and was aware that I was there. I'll find and put up another of my raven stories which left me no room for doubt. I look at it differently. If birds had created airplanes early on in their evolution they probably wouldn't have developed wings themselves. My stepping off the technology bandwagon doesn't mean I will sprout wings but it might mean that future generations that consider my example and extend the trend just might if there is anything to the theory of evolution. Intent has a lot to do with it. Time To Choose: Will you be an agent of depletion or regeneration?